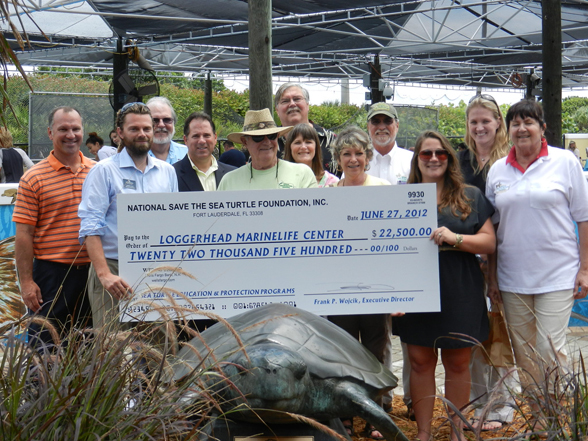 Loggerhead Marinelife Center received a very generous donation of $22,500 from the National Save The Sea Turtle Foundation, which in part benefited the LMC research department. This donation will be used to purchase new, highly-precise GPS equipment for use during the sea turtle nesting surveys. LMC will now be able to monitor not only centimeter accurate locations but altitude as well. This will be extremely helpful during periods of erosion and storm activity. An altitude measurement will allow us to know with certainty whether or not a nest has been washed out. It will also improve our ability to map beach profiles and changes in dunes and high water lines. The added benefits of this new system will allow us to collect measurements that many don't have. Additionally, funding from this donation was used to purchase night vision scopes to be used by our education department to conduct night time Turtle Walk programs. We wish to express our sincere gratitude to the National Save The Sea Turtle Foundation for these generous gifts. Back Row, (Left to Right), Matt Pazanski, Town of Juno Beach, Director of Finance; Dr. Charlie Manire, LMC Biologist; Joe LoBello, Town of Juno Beach, Programs Coordinator; Carl Fisher, Board Member, NSTSTF; Nancy Fisher; Captain Andre Hardy, Donation Consultant, NSTSTF; Kelly Martin, Biologist LMC. Front Row, (Left to Right), Tommy Cutt, Director of Operations, LMC; Frank Wojcik, Executive Director, NSTSTF; Eileen Nesdale, Program Management, NSTSTF; Rebecca Mott, Public Programs Coordinator, LMC; Helena Shaff, Board Member, NSTSTF.